“Spriggan” is a catch-all term for a psychoactive phenomenon experienced by the sentient life of the Eretejva Tundra, though there is little agreement in how many types of Spriggan there are, or even a true physical description of the ones already documented. 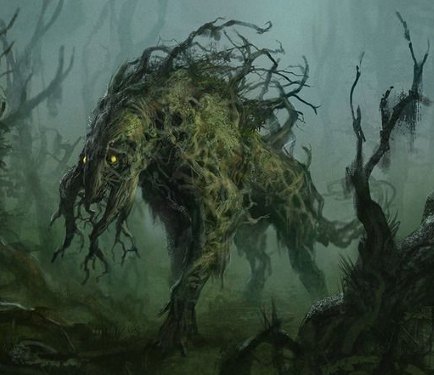 What is typically agreed upon in Lore is that these creatures come from a different realm, and they often leave those they encounter corrupted, monstrous, violent, and deadly. The cruel Spriggan never talk, so it is unknown if they have a language or not, and what that may be. Kinder Spriggan have been known to speak Common and Fiirevik, though their word choices are sometimes wonky, as if mistranslated or deliberately bizarre. This a subject of controversy, as the Spriggan are not seen with one’s eyes, but perceived directly in the sight centers of the mind. Their image is distorted, as if seen in the periphery, and is frequently subject to mental processing biases and misremembering when recalled later, especially after comparing notes with other experiencers. Not to mention, the Spriggan will usually target the psychologically weakest of the group, as the tired, insane, starving, irresolute, and stupid are always the easiest corrupt. These people, in their varying states, have a more difficult time successfully communicating ideas clearly to their peers. 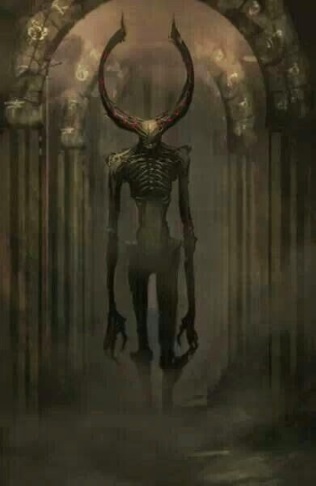 Often, the malevolent Spriggan are described as having horns or a crown, vague (but still present) facial features, quite tall and lean, and seem to be humanoid, though alien. They are said to appear “Sinister,” but it is hard to really nail down what that means. Encounters with aggressive Spriggan typically experienced along faultlines, though, sometimes, they occur near ancient, abandoned ruins. The rarer, more benevolent entities, however, have their own weird rules for making an appearance. The most uniting concept in regards to the Spriggan and their “traits” is that they may not have any at all. They leave behind no bones, no hair, no saliva, blood, footprints, or forensic evidence of any kind. The sheer volume reports is the only thing that qualifies their existence at all. When a Spriggan appears, be their intentions good or bad, they do not actually “appear.” One sees the Spriggan not with their eyes, but perceives them automatically with the appropriate centers of their minds. This goes for all other senses as well. As though it were a dream, these perceptions as to the creature’s exact dimensions or how it could currently “exist” within the same environment of the tormented sometimes do not make rational sense, and are often edited by the claimant to bring them in-line with reality…which, of course, they are anything but. The clearest indicator of their effect on the world at all is that of the “possession.” That is when something that was one way becomes magically transmogrified to become, instead, some violent, monstrous version of the way it had been before. The creature is almost a parody – like its prior form, but exaggerated, or misassembled, or swollen and pulsing with green energy. It is the way it was, but obviously and grotesquely wrong. Domovoi – Domovoi are understood to be benevolent creatures, manifesting as small, scruffy old men/goblin-type things that range in color from evening blue to midnight black. They are said to be “spirits of the hearth,” and protect the homes of the Nordenfiir. People claim they have heard them speak Common and Fiirevik. As the Nordenfiir of Withereach are known to be notoriously poor sleepers (due to their Silicosis), most stories of Domovoi encounters go something like this: Nordenfiir is awoken in the middle of the night by coughing fit. Nordenfiir notices a certain “intense darkness” in the corner of the room, which, upon scrutiny, seems to have a figure in it. Sometimes, the Domovoi is sitting directly on their chest, preventing movement. Figure attempts to communicate, usually talking about something to do with house upkeep or the family. Nordenfiir drifts back to sleep, barely remembering the conversation come morning. If this sounds like Sleep Paralysis to you, you’re not wrong. The impulse is to label this as magic. It’s not. Up until the point of corruption, the experience of the Spriggan is a purely natural phenomena. Though it is unknown to the world, the Spriggan have been around at least as long as the continental divide. The tremors of volcanos and earthquakes are directly responsible for their presence, as stones that are wedged deep into the earth resonate with the shifting of tectonic plates, creating a sonic effect in the weakened minds of passer-bys which creates this effect of the malevolent, trickster Spriggan in their brains. Due to the absence of physical evidence regarding the Spriggan itself during this effort at “possession,” it is unclear if this experience is A) a hallucination the brain manifests to account for the transmogrification process, B ) an alteration to brain chemistry that enables the experiencer to gaze into a realm normally just outside the limits of all sentient perception, C) an entity that actually exists or travels through one’s brain chemicals, or worse, pure thought, or D) some incredibly powerful monster and master of illusion. What’s more, due to the variability in the creature’s description, it is unclear if there are A) many types of Spriggan, B ) many individual of a type of Spriggan with some benevolent creatures unfortunately mislabeled, or C) one individual Spriggan monster that has been tormenting the landscape that nobody can describe because they lack the resources, while an entire other realm has been mischaracterized by its misdeeds. 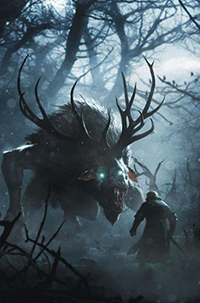 It is unclear how long the Eretejva Tundra has known of the existence of Spriggans, but some proto-race to the Nordenfiir appear to have had a more direct relationship to them. In ancient ruins, there are often pillars that utilize a synthetic form of these “resonant stones.” The Spriggan, by intention or simply shared goals, can act as a guard for these places, taking advantage of weary adventurers before they go somewhere they shouldn’t. The malevolent Spriggan do not talk to their victims. They do not bargain, nor invite them into the realm to learn special “Demon Magic.” They cannot be attacked by magical weapons because, well, where would you attack? Similarly, they cannot be attacked by elemental magic, either. The best defense (short of avoidance) is to stay healthy and sane. If one would need to use Magic, however, one under Spriggan attack could defend themselves using psychic-based magic, but not the minds of others. The best way to save your friend is relocation. The skillset of Withcraft of Eretejva Tundra and the witches who practice it have a sensitivity to the presence of benevolent Spriggan, and even the malevolent ones, as well. That said, the sensitivity to the malevolent Spriggan is not hyper-developed. They know not of the stones, nor the pillars (like everybody else), they can only sense that the psychological attack is somehow facilitated by sonics – and they can reinforce it or diminish it with their own song. They would likely know some of the sites where Spriggan attack is popular within areas local to where they frequent the most. 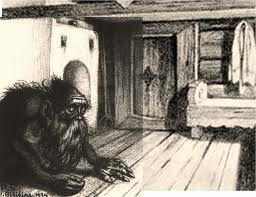 Positive Spriggan, such as the Domovoi, are sorta believed and not-believed. Their contributions are minor and unthreatening, so regarding them as anything at all tends to be kind of a tongue-in-cheek, folksy charm. If somebody forgot to clear the table after a meal, for example, they might say they “Left some for the domovoi,” but they and everyone else known that they were just lazy. People know it lives in the house and they might totally “see one” in the middle of the night, but, like, not really. It is unclear if this has some historical truth to it, or if the story came later. Regardless, where as older adventurers understand what occurs as possession or corruption, younger Nordenfiir increasingly believe that the Spriggan steals away their target and replaces them with a Changeling. It is a popular belief that the monster comes from some sort of “Fae Realm,” but academic discussion on this is discouraged and viewed as pretty dumb. If there is a physical component to this space, it is not something one can theoretically access in the same way one might where-ever Velaeri or the Pale King came from. 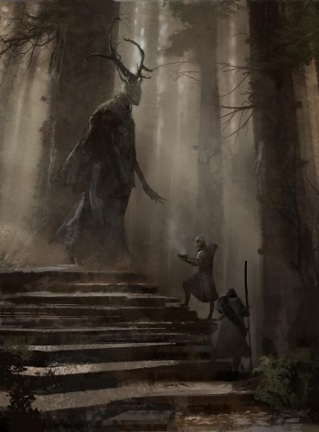 There is an unpopular philosophical perspective among the Witches to attribute Satan-esque qualities to the Spriggan, marking him and his work as the work of one, singular Horned God – a component, oppositional symbolic figure to She-Of-Three Voices. Some argue that this desire to invent an additional conquering male deity when there is no need or proof speaks to the effectiveness and the remnant of patriarchal brainwash. The association with stone and seismic activity is unknown. This page has been seen 78 times.